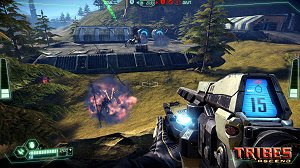 Tribes Ascend is the exciting free-to-play follow-up to the classic first-person shooter franchise. It’s developed by the same team behind the well received Global Agenda: Free Agent game and already has the attention of many players who are looking for a great looking and fast-paced sci-fi shooter. Some classic maps from Tribes 2 will make a revamped appearance and Tribes Ascend will launch with the game modes Capture the Flag and Rabbit, although others such as Team Deathmatch will soon be added.